The theme for this year's Green Building Series is "Building Local Resilience". The presentations and tours aim to help residents in our region develop a greater capacity to adapt to changes we may or may not foresee. Making better use of resources and preparing for prolonged disaster recovery periods are things we can do now in order to be in a better position to restore the order and quality of lives during challenging times. Are you planning to build a new home? There are many opportunities at the planning and design stage that could help create a place that brings a high level of satisfaction, avoid costly and unnecessary headaches, capitalize the potential of a unique site, and cost very little to run for years to come. Local architects and designers will share their insights on how to approach design when it comes to creating a 'green' home, discuss options on building materials, construction methods, energy systems, and how to select or work with contractors and trades. On the coast, winter rain is plentiful - and free! Why not catch it and save it for the dry months? Local experts from Rainwater Connection will provide hands-on examples of rainwater system components and discuss different design options so that you can use "sky water" to irrigate your garden. When natural disasters strike, you may have to figure out how to survive on your own for one week or possibly a month. Are you prepared? Our Emergency Coordinator will walk you through all the steps you can take to build disaster resilience and improve your emergency preparedness on your own property, from getting necessary energy and water supply, maintaining sanitation, producing and storing food, to looking after family, pets and livestock. Do you wish you have a backup energy source when there is a power outage? Do you have a cabin in the remote area that could use a clean and reliable power source? Or maybe you would like to know how to produce your own energy and offset your hydro bills? If your answer is yes, this presentation is for you. Local experts will explain renewable energy systems that harness solar energy, wind power or the power of running water in residential applications. The costs and the logistics of various renewable energy systems will also be discussed. Hop on the shuttle and visit three unique rain garden and bioswale sites in the City. Local experts will explain the design and functions of these alternative systems that mimic the nature. Not only do these systems provide the valuable service of draining stormwater, but they are also attractive features that add values and sometimes unexpected benefits to the area. 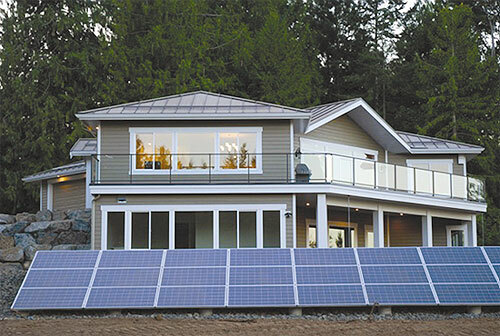 This 3,900-square foot home in Yellow Point features full indoor- and outdoor-use rainwater harvesting, solar photovoltaic system, heat recovery ventilation, and a ground-sourced geoexchange system that pre-heats domestic hot water and provides radiant in-floor heating. Passive solar design includes an in-home greenhouse heated by the geoexchange system for seedling starts and tropical plants. And abundant food production based on permaculture principles is managed through a highly efficient drip irrigation system. Materials and design focused on a tight envelope helps the project achieve an EnerGuide rating of 90. After one year of operation, the owners will only need to pay approximately $200 to BC Hydro. Water testing from the rainwater harvesting system confirms the water is of high quality, suitable for drinking. Both indoors and outdoors, this home's extremely efficient, comfortable, and low-maintenance environment proves that sound design, green building technologies and efficiency measures can support a sustainable lifestyle. Click Here to view a video describing this house. For more information about the project, please contact Emanuel Homes Ltd. through emanuelhomes@gmail.com. 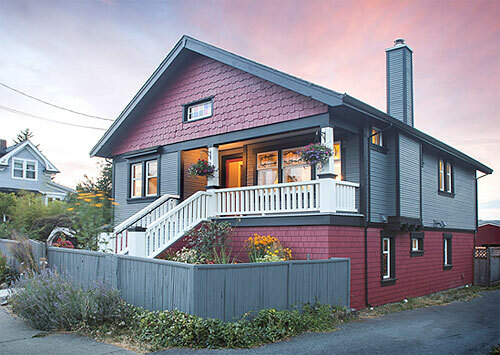 This delightful one-hundred-year-old Craftsman home has recently undergone an extensive remodel and energy upgrade. The first phase of this project is now complete. The initial project included lifting the house approximately 2 feet, upgrading all mechanical and electrical systems, and insulating the house to the current standards. The home's floor plan has been revised to increase the sense of light and flow. Original doors, trim, fixtures, brick, windows, and flooring were salvaged and re-used where possible to maintain the character of the home. The combination of traditional elements with modern, urban influences makes for a stunning new living space. Cypress trees were removed to increase light in the yard; the wood was then milled and reused in the front porch railings. Phase two involves nesting a master suite in the attic to complete this major upgrade. For more information about the project, please contact Ken Connolly at Pheasant Hill Homes Ltd. His email is ken@buildbetterhomes.ca. 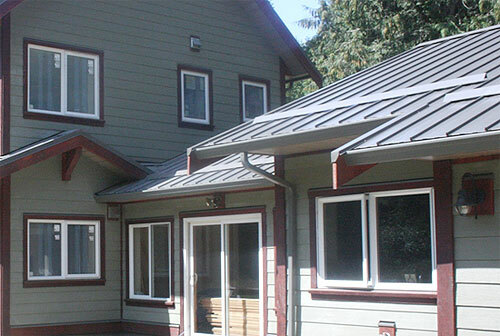 This passive solar home and in-law suite is located on six acres of land in Qualicum Beach. The home is being built in two phases: the first (complete) involved an in-law suite designed with aging-in-place concept in mind; the second (under construction) involves a two-storey family home. The owners' goal is an energy efficient house that takes advantage of the location's southern exposure and available timber on site, and provides a suitable living space for three generations. Striking a balance between advanced building technologies and affordability is also important to the owners who are dedicated to reducing their environmental footprint on a realistic budget. House features include extra thick staggered stud walls, blown-in cellulose and exterior rigid Roxul insulation; site-milled trim, beams, posts, rafters and flooring; and increased seismic resistance. Onsite garden space, proximity to town, and multi-generational living contribute to the owners' desire for a holistic lifestyle that considers food security, community, and family. For more information, visit the owners' blog at www.agreenhearth.com or contact Bruce Fleming-Smith at Oceanside Design at www.oceansidedesign.ca.